For reasons as cited in the article below, it was decided to take the first official opening of polls in Dixville Notch. However, this choice was as subjective in many ways as using one of the various birth times put forward for Hiliary Clinton, due to the fact that postal voting took place months earlier in some states, and, according to a report on Radio 4 just prior to the election, over 42 million votes had been cast. The main thrust of our article was simply to look at the rules of mundane astrology as used by the Medieval astrologers and put them into practise. We cited Masha’allah from the translations of his work by Ben Dykes (Revolution of the Years of the World”). 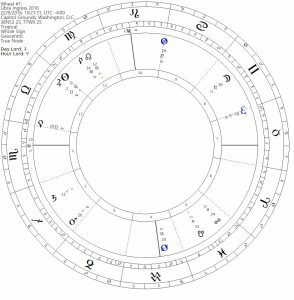 Some traditional astrologers in the USA did use the Aries Ingress chart, but appeared to overlook the rule, that if a mutable or cardinal sign was on the Ascendant for the location of the Ingress chart, you need to cast and use the other Ingress charts. In this instance for Washington, the Aries Ingress had a mutable sign rising. A mutable sign rising meant you should use the Aries chart up to the Libra Ingress, and then use the Libra Ingress for the next six months. If a Cardinal sign rose, you would then cast charts for all four Ingresses. This election also raises the possibility that Donald Trump’s rising sign may well be Virgo and not Leo. A heretical notion (to many), but nonetheless, when you analyse Trumps chart using Virgo and traditional rulerships, it paints a very different picture to that of a pompous, arrogant, selfish misogynist. Instead, without going into lengthy details, it indicates someone with a love for women and devotion to the homeland. It also has those women in his life as definitely visible and being good friends with the native. His two ex-wives have stood by him and Ivana Trump did recant what she said about him after their divorce. The fact that he obviously does love women, albeit in a way that some find abhorrent, only lends further credence to a Virgo rising. American Presidential Election and why we wouldn’t make a Prediction on the outcome using birth times of the Candidates. It seems a day hasn’t passed since the start of 2016 when there hasn’t been some news coverage regarding either Hillary Clinton or Donald Trump, other than the time taken up with the Brexit outcome here in the UK. Things on the Internet are now starting to heat up especially since the first head to head between Trump and Clinton on the 26th September. Much of the animosity and finger wagging centres primarily on that most vexatious issue of unknown, or verified birth times for Hillary Clinton where times range from 8:02 am to 8:02 pm; as well as 10:48 am and yet another birth time of 02.18. According to astrologer Marc Penfield, both the Cook County and State of Illinois record divisions last week verified a time of birth as recorded for Hillary Rodham that took place on October 26, 1947. If correct, it is not the commonly used birth times of approximately 8:00 am or 8:00 pm. Marc will be on the closing Presidential Election panel 2016 ISAR Forecasting Symposium on Sunday, October 16, 5 pm (PST). He will reveal the Democratic contender’s time of birth then, and the process he went through to find this KEY missing astrological link for forecasting the 2016 USA Presidential Election. So now, we have even more suspense building up to the most exciting astrological event of 2016! Marc Penfield’s time he claims to have sourced is 02.18am. This certainly has a ring of déja vu about it. Zayin Cohen was originally reported as giving a time of 02.18am back in 2005 and ADB recorded this. He claimed to have accessed Hillary Clinton’s time of birth through a contact in the Chicago Records Office who sourced her birth certificate for him. It was then reported on astrology groups like the Noel Tyl site. However, I corresponded with Zayin Cohen a few weeks ago. Zayin Cohen then claimed the time he had actually found was 02.08am not 02.18am. He said it was incorrectly reported on ADB and elsewhere. However, with the death of Louis Rodden it never got resolved. Like Marc Penfield, Zayin Cohen claimed to have an anonymous source in the Chicago Public Records office. He has long said he cannot give out the certificate or details of the official as this is illegal. But I have been in contact with Patrick Watson today and he showed me evidence of a FB conversation with Zayin Cohen back in August when he was informed by Zayin Cohen that the right time was actually 01.18am not 02.18am. I am trying not to throw out accusations here but Zayin Cohen is clearly giving out conflicting times. So was the time on the birth certificate always really 02.18am which has been corroborated by Marc Penfield? In which case why is Zayin Cohen now altering his time? Did Marc Penfield really source this directly or is he just using the time that was widely attributed to Zayin Cohen earlier which he now himself disputes? Or maybe Zayin Cohen is playing games with us and the time was always 02.18am. Presumably, like Zayin Cohen, Marc Penfield will not be able to produce a scan of the birth certificate for legal reasons. Leaving aside birth times for Hillary Clinton, there is also a modicum of doubt to be raised regarding Donald Trump’s Rising Sign. 23 seconds into the AA rated birth time of 10:54, the Ascendant moves from Leo into Virgo. So there is more Virgo in that minute than Leo. When I mentioned this fact during Hakan Kirkuglus’s talk at the AA Conference, Michael Lutin shouted and said how I could I be so stupid – of course Trump is a Leo, you just have to look at him. Well that is the common perception, but from a Traditional perspective, if Trump did have Virgo rising it would explain the multiple marriages and strong family ties and good relationships with his ex-wives even more than the fixed Leo Ascendant/Aquarius 7th house. So to my mind there is doubt about both candidates and their Ascendants and therefore their personal house relationships. There is no definitive “birth time” for the Republican and Democratic parties. So what could be used to call this election? A traditional mundane method was always to look at the Aries Ingress and if needed, the other Ingresses of the quarters dependent on the Rising sign of the Aries Ingress. If a fixed sign rose, that chart was good for the year. (This is indeed the case with the UK Aries Ingress 2016). If a mutable sign, the chart was cast for both Aries and Libra Ingress’ and if a Cardinal sign rose, then each quarter you cast a new chart. Taking Washington DC as the Capital for America, the Aries Ingress for 2016 had the mutable sign of Sagittarius on the Ascendant. The lord of the Ascendant, Jupiter, is also in a mutable sign together with the mutable ascendant emphasising the need to look at the Libra Ingress. The Libra Ingress chart has Scorpio rising and is valid for the period covering the election to the actual Inauguration of the Presidential Candidate on the 20th January 2017. In the UK with the Brexit vote, Mark Cullen the Moderator on Skyscript, put together a fairly comprehensive list of methods used by various astrologers to make their predictions. Of those 16 in his sample who correctly voted leave, 4 used opening of the Polls along with other techniques. Maybe this method would shed some light on the potential outcome of this most bitter of elections? Due to the time changes across America, the first State to open its polls is the New Hampshire state of Dixville Notch at 00.00 on the 8th November 2016. There are two ways we could look at this chart for Incumbent and Challenger; one way is to take the 1st for the current Ruler and the 7th for the challenger, or the 10th for current King and 4th for challenger or opposition. We will look at both ways, although the actual significators using whole house signs doesn’t change. We will start with the 10th/4th axis. The 11th is for the supporters of the current King and the 5th for the supporters of the challenger. The 10th is ruled by Mercury, who is under suns beams, his supporters are the Moon (also the common people). The challenger is Jupiter and his supporters are Saturn. 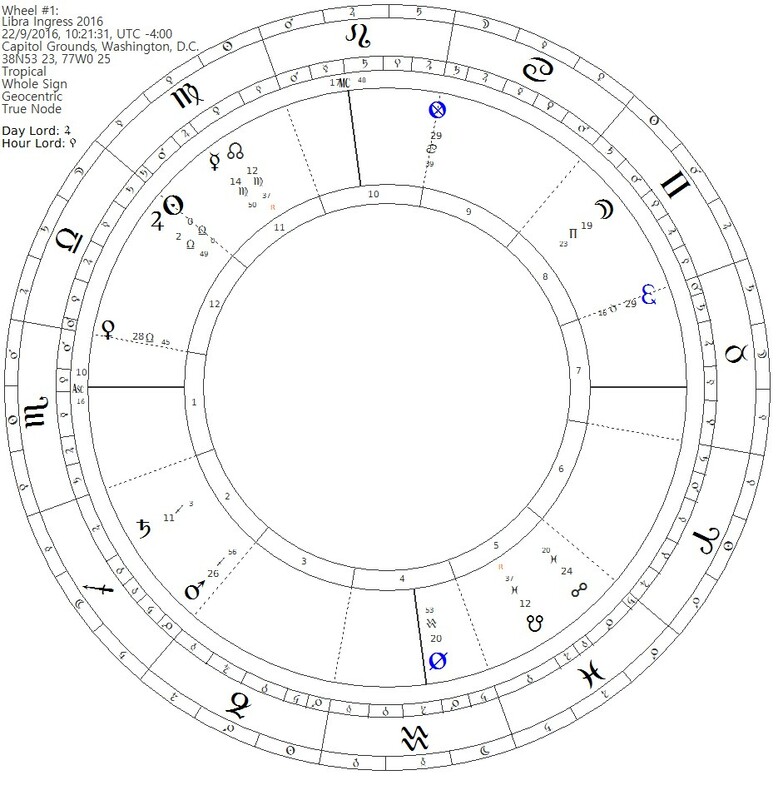 Taking Mercury to represent the incumbent party; Mercury has no rulership in 23° Scorpio and cannot see the 10th sign of Gemini from the 3rd sign, which simply means it is blind and cannot effectively manage the affairs of the house Gemini represents. We find Mercury just on the edge of Sunbeams moving out of the harmful rays. 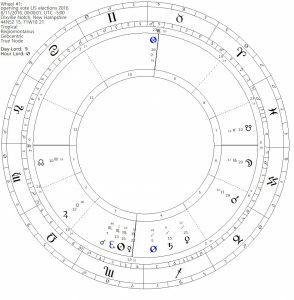 As Mercury leaves the rays of the Sun he applies to his ruler Mars, wanting to give his authority and management of 10th house affairs to Mars which is in its exaltation. However before Mercury can exit from the rays of the Sun, the application is frustrated as Mars leaves Capricorn into Aquarius. This does not bode well for the incumbent party. Jupiter representing the Challenger or opposition party has authority as participating triplicity ruler in Libra. Jupiter is applying to Saturn giving his power and authority to Saturn to manage Jupiter’s affairs [this is called the committing of his disposition], which Saturn accepts because Jupiter is in the sign of Saturn’s exaltation [reception]. Also, Saturn has authority in Sagittarius as participating triplicity ruler of Fire. Saturn in the 4th is angular and has the strength to carry out the business of Jupiter. Jupiter is operating out of the turned 11th house from the 4th. This is the house of Good Daemon and Jupiter is said to rejoice in the 11th. Saturn is also indicator of Jupiter’s Seconds or helpers. Saturn is bang in the middle of Jupiter’s sign, giving his aid and assistance to Jupiter. The Moon as indicator of the Incumbents Seconds is tucked away in the 6th of sickness and labour. She can’t see her house and is in the sign of Saturn. Her next application is to Mercury, indicator of the current ruler. She perfects this aspect with a square, showing some difficulty. If we take the Moon to represent the people, it shows they are in slavery, sick and not very effective. The Moon takes the light of Mercury to Venus by Sextile. Venus in this chart disposes of Jupiter as he disposes of her. So there is some reception between these two planets. Venus cannot see Mercury to give him her aid. The women are turned away from helping the Incumbent. Taking the Rising sign of Virgo for the Incumbent and the 7th for the challenger, we have the same planets as significators. All that has changed is their house positions. Mercury is now in a cadent sign but can see the Ascendant sign. However, his power to act is weak as he is still blinkered by the Sun who rules the 12th of enemies. The Sun is blinding him to what is going on? Jupiter on the other hand is in his participating triplicity rulership, oriental and strong. Jupiter can see neither Ascendant nor Descendant, but, through his application to Saturn in an angle, Saturn reflects Jupiter’s light to his house, Pisces (called rendering of light). In this changed situation in assigning different houses, Saturn is the means whereby he Jupiter can manage the affairs of the 7th. Jupiter can also see his other house, the 10th sign from the Descendant (Sagittarius). The same comments apply to Jupiter’s relationship to Saturn as mentioned in our first scenario (10th/4th axis). 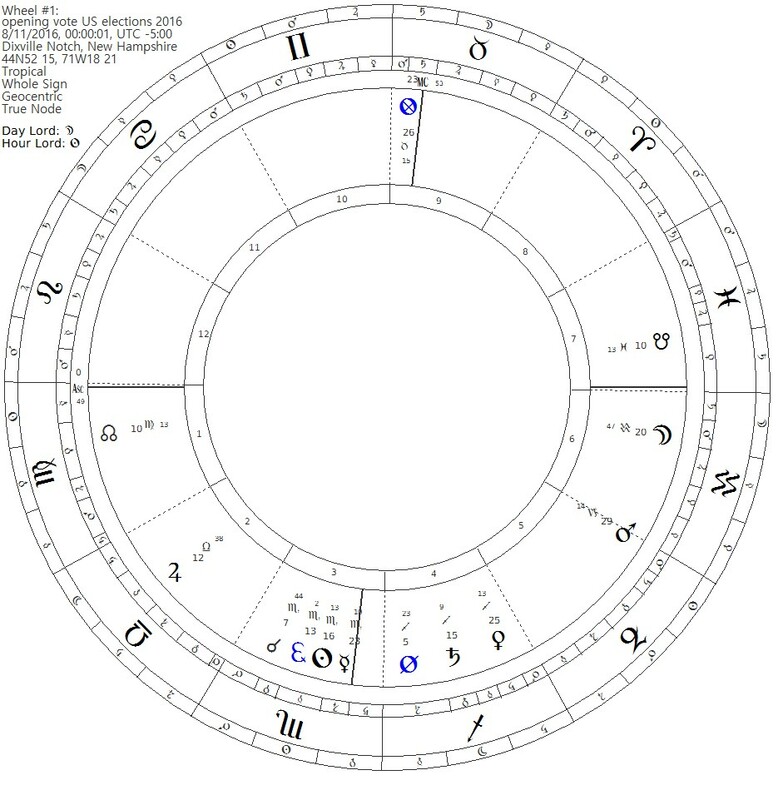 If you look at this chart using house divisions, so the 10th cusp is Taurus and the 4th Scorpio, Venus is still in aversion to her sign (can’t manage). Mars can see his sign of Scorpio by sextile. The Sun (reputation, honours) is in the 4th by division. Mars, the ruler of Scorpio, is exalted in Capricorn at the time of this event! No matter how you view this chart for the opening of polls, it appears to give the victory to the Opponent. Traditionally the first thing to locate was the Lord of the Year of the Ingress chart. The first consideration is to determine what planet will represent the people of the nation. The ascendant of the chart always represented the people of the nation as did the Moon. The Lord of the Year was found from one of the lords of the ascendant (ruler, exalted ruler, triplicity ruler, or term ruler) or even the sect luminary. In this chart we have chosen Mars as Lord of Year since he is the lord of the Ascendant Scorpio. We do this in spite of the fact he is cadent from the ascendant in the 2nd house. The reason for this choice is that in fact all the rulers including the sect luminary, the Sun, fall cadent of the ascendant. This very accurately describes the state of the people in America going into this half of the year. If the Lord of the Year were cadent from the Ascendant, not aspecting the Ascendant (in the eighth, sixth, second, or twelfth sign), then he will be in need, and therefore weakness will befall him, because he fell in a place removed from the Ascendant: (From the “Revolution of the Years of the World” by Māshāʿallāh translated by Benjamin Dykes PhD. Both Mars and the Moon representing the people are in aversion to the Ascendant. The people feel out of touch and powerless to act. The Martian types are in conflict and also out of touch with their national identity. For both significators there is a sense of helplessness, weakness, division, contention and fear. Note that the Moon’s application to the opposition of Mars further indicates the very obvious division of the nation. The incumbent Ruling Party is shown by the Sun as ruler of the 10th sign/house. (Note: the Sun would not necessarily always be the significator of the ruling party if another sign were on the MC). Their opponents are indicated by Saturn as ruler of the 4th sign/house. To discover the successor belonging to the current ruling party, we look to the second triplicity ruler of the Sign on the 10th. This gives us Jupiter as the Nocturnal Sect Ruler of Fire. Jupiter is under Sunbeams, out of sight in the 12th sign. This suggests a weak successor who cannot be seen. This relates perhaps to Hillary not being so visible on the campaign trail. Obama has been actively campaigning on her behalf. Naturally the Sun being in Libra is in detriment and in the cadent 12th; the King is no longer strong. Hillary’s recent health problems and public collapse could also be indicative of this weak Jupiter. To assess the condition of the opposition, we will take both the actual sign ruler (Saturn) and the diurnal triplicity ruler of Air – again Saturn. So Saturn indicates the opposing candidate. There is no other planet to consider as they (the opposition party) have put up their challenger. Neither significator of the people (Moon & Mars) applies to join either candidate, again indicating the disconnectedness and “hatred” by the people for the two candidates. It appears in the history of the American Elections that no two contenders for this crown have been so reviled by their countrymen. So how to discover the outcome? We look at the individual strength of both significators and the actions between them. As noted, Jupiter is combust, in the 12th and applies to Saturn from Saturn’s house of exaltation (Libra) and his house of joy. As we saw in the other charts we looked at, this handing over of power is a very distinct action between the two because it indicates Jupiter handing the management of everything she is and represents, to Saturn who receives her gift! Saturn standing alone is stronger than Jupiter, being free of sunbeams, and able to manage the affairs of his house of Aquarius. The conclusion is that Saturn is the winner.